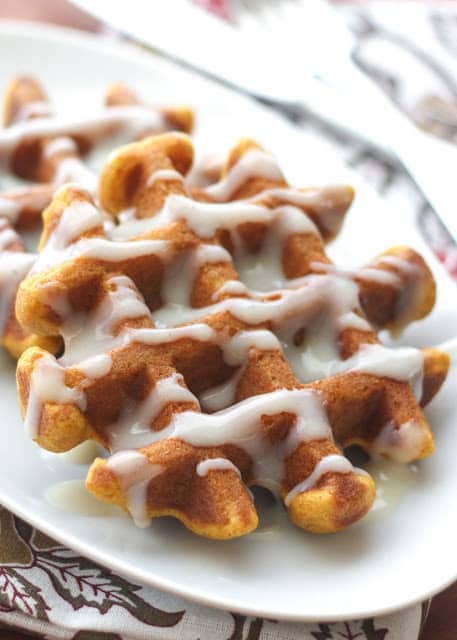 These are crisp and fluffy Pumpkin Spice Waffles filled with plenty of spices; they remind me of the pumpkin muffins we have loved for years. This recipe comes together in just a few minutes and the house smells wonderful as they are cooking. My boys devoured this whole batch just as soon as they were off the waffle iron. More often than not, I serve these waffles with my grandmother’s Vanilla Waffle Sauce. 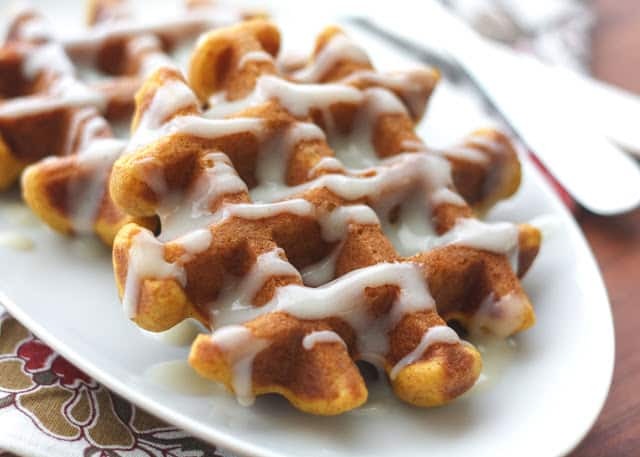 (Waffle Sauce is our favorite topping for almost every sweet breakfast!) They’re also delicious with maple syrup or Brown Sugar Butter Syrup. These waffles are a great way to welcome September; and I’m sure we’ll be welcoming our first cool and rainy days of fall with another batch of Pumpkin Waffles, for breakfast or for dinner. 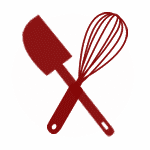 Kitchen Tip: I use this waffle iron to make this recipe. Preheat your waffle iron. Whisk together the pumpkin, eggs and the buttermilk until smooth. Add the flour, baking powder, baking soda, salt, spices, and brown sugar. Stir until smooth. Stir in the melted butter. Pour batter onto the hot waffle iron and cook until crisp and browned. Serve with the toppings of your choice. Enjoy!